BUCKLEY, James Lane, a Senator from New York; born in New York City, March 9, 1923; received secondary education at the Millbrook School, Millbrook, N.Y.; graduated Yale University 1943 and received his law degree from the same university in 1949; enlisted in United States Navy in 1942 and was discharged with rank of lieutenant (jg.) 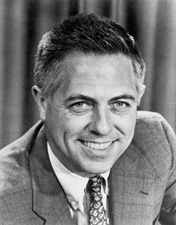 in 1946; admitted to the Connecticut bar in 1950 and commenced practice in New Haven; joined the Catawba Corp. of New York as a vice president and director 1953-1970; elected as the candidate of the Conservative Party of New York State to the United States Senate in 1970, and served from January 3, 1971, to January 3, 1977; unsuccessful candidate for reelection in 1976 and for election from Connecticut in 1980; Under Secretary for Security, Science, and Technology, United States Department of State 1981-1982; president, Radio Free Europe/Radio Liberty, Inc. 1982-1985; federal judge, United States Court of Appeals, District of Columbia Circuit 1985-1996; is a resident of Sharon, Conn.
Buckley, James L. Gleanings from an Unplanned Life: An Annotated Oral History. Wilmington: ISI Books, 2006; Buckley, James Lane. If Men Were Angels: A View From the Senate. New York: G.P. Putnam's Sons, 1975.